wildest racing game with high-performance dream cars. One of the wildest car racing game on the Android platform. 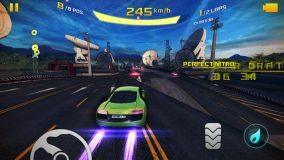 Asphalt 8 Airborne is developed by Gameloft as an arcade racing game which you can play as a single player on your mobile or multiplayer online. With brilliant graphics and out of this world stunts that you can perform with your cars, this game is bound to keep you hooked to your mobile screen. Asphalt series is one of the most popular race car series on the mobile platform and Gameloft has been up to the mark with high-end graphics and a strong storyline which in return captures the player’s full attention. The main screen of the game can be a little intimidating, and it takes a while to figure out the various options. Asphalt 8 Airborne rewards for tricks you perform while you are in the air, like doing Barrel Rolls or Flat Spin Jumps. You can do Barrel Rolls by driving onto one of the many angled ramps present on the track, letting a mix of gravity and momentum do the rest. Flat Spin jumps are a bit trickier to perfect, as they require you go off a ramp while drifting (braking the car at high speed while steering it). The graphics are outclassed and enable the game and gameplay to be as realistic as possible. You can play Asphalt 8 Airborne in various modes including World Series (Multiplayer over the Internet), a local Wi-Fi race, a quick Solo race, or the Career mode. In Career mode, you start with a car and a pretty minimal budget and try to earn more money by winning races and performing tricks. As you go along, you also have the opportunity to pick up stars that unlock the next racing events within the season. You can pick up to five stars at each event, with 3 based on where you finish (1 star for finishing third, 3 stars for winning the race) and two additional stars for achieving event-specific objectives like doing the specified number of Barrel Rolls, Knockdowns, Perfect Nitro Triggers, etc. What's new in this version of Asphalt 8? PREPARE FOR THE CHAMPIONSHIPS Unlock a premier muscle car, the Equus Bass 770, and the 600-horsepower Spyker C8 Preliator in their dedicated Championships! PININFARINA H2 SPEED The world’s first highly efficient hydrogen-powered race car is waiting for you in an all-new R&D Event. REZVANI BEAST X R&D EVENT Feel the power of the beast in this Class-A ride. INVENTORY REWORK We're making significant improvements to the inventory system to help you find what you're looking for.